Relevance pS2 is a cysteine-rich, 6.5kDa protein found in both oestrogen-dependent (breast tumours) and oestrogen-independent tissues (normal stomach mucosa). About 60% of breast carcinomas are positive for pS2. 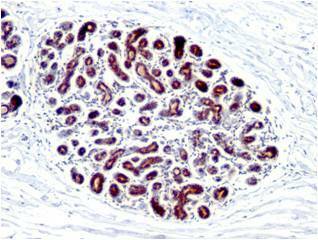 Staining is cytoplasmic, often with localisation to the Golgi apparatus. 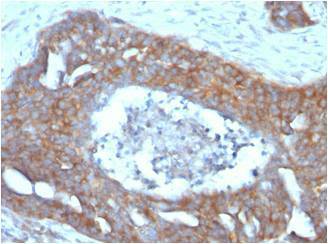 pS2 is primarily expressed in oestrogen receptor-positive breast tumours.